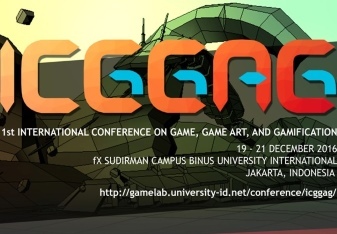 From 19th-21st December 2016, BINUS INTERNATIONAL will host the first International Conference on Game, Game Art and Gamification (ICGGAG), which is to be held at BINUS INTERNATIONAL’s FX Sudirman campus, Jakarta. In preparation for the event, the university encourages industry experts to submit research papers on the latest developments in the sphere of game, game art designs and gamification. The accepted publications will be uploaded onto IEEE Xplore and SCOPUS; two renowned digital libraries that caters towards scientific and technical content. As host of the event, BINUS INTERNATIONAL’s upcoming conference provides the opportunity to demonstrate the potential use of gamification initiatives as a platform to motivate and engage students and employees in the learning process. The ICGGAG conference is set to focus on an array of topics which will include augmented reality, games for education, games for business, games for social innovation and change as well as games-based learning among others. Moreover, through its call for paper initiative, BINUS INTERNATIONAL is also spurring discourse on the advancement of Indonesia’s gamification sector and its potential use in the country’s development. The event will also feature keynote speakers Prof. Scot Osterwell of the Massachusetts Institute of Technology and Prof. Daniel Fung Shuen Sheng of Nanyang Technological University — both will offer their invaluable insights into educational games and their effects on both the academic and commercial environment. With Indonesia’s tech-savvy population and young demographic, there is increasing demand for the use of gamification techniques in Indonesia’s education system. The use of game-thinking and mechanics is said to affect students’ level of activity, engagement, interactivity and motivation and increases their fluid and crystallised intelligence. This method of teaching enhances the learners’ ability to solve new problems and utilise new knowledge and experience. BINUS INTERNATIONAL’s specialisation in IT is continually striving to adapt to the shifting technological and social paradigm where many sectors and the creative industries are now inter-linking. Through the conference, BINUS INTERNATIONAL will demonstrate how the potential use of gamification technology can help foster innovation and creativity in education and inspire its students to develop the technical skills for an increasingly competitive business climate. For more information about the ICGGAG 2016 and the submission date for research papers, please click here.